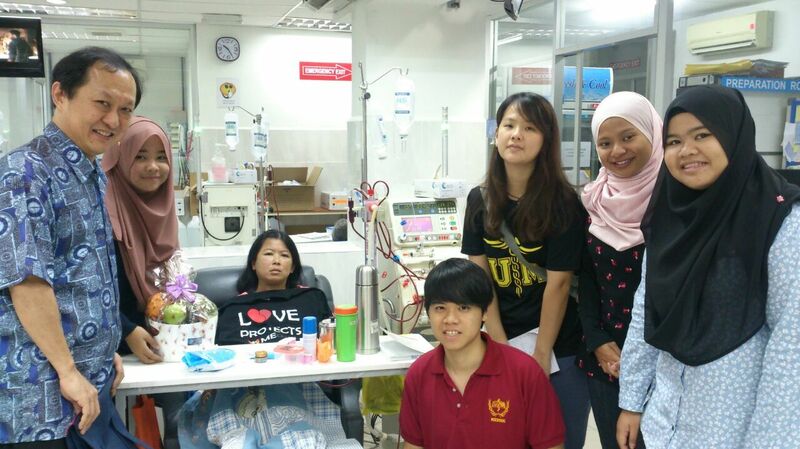 On 24 January 2015, Professor Dr. Cheng Hwee Ming from the Faculty of Medicine, Universiti Malaya together with 10 students from the university’s medical society paid a visit to Pusat Dialisis NKF- Rotary Damansara (Batu Caves, Selangor). The visit is part of the on-going “Sympa-T” shirt project, the brain child of Professor Dr. Cheng Hwee Ming. 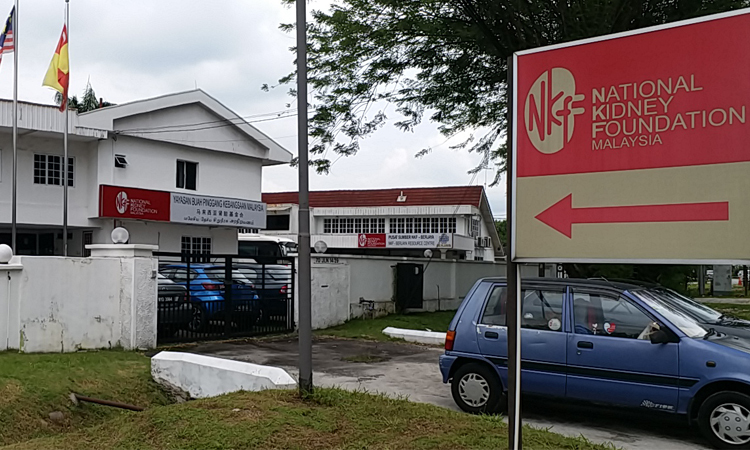 It involves visits by members of UM Medical Society to poor kidney patients in dialysis centres in NKF to empathise with patients their anguish in facing chronic kidney disease. 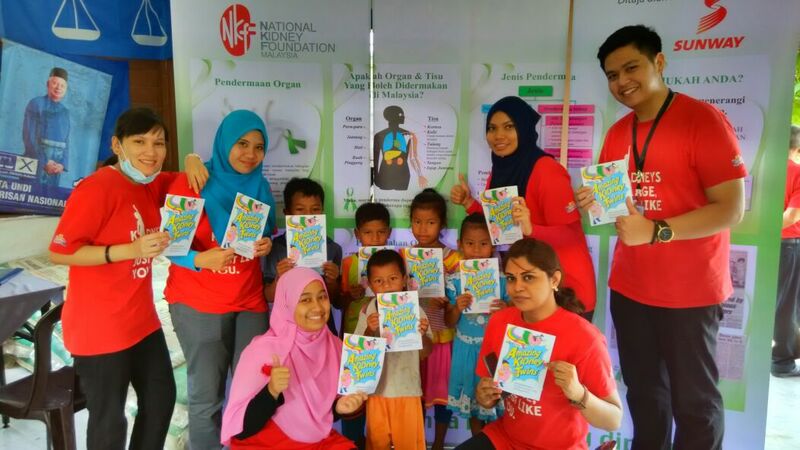 In its role in complementing and supplementing the health services provided by the government, NKF serves all Malaysian communities. Accordingly, the Foundation has made forays to reach out to the Orang Asli communities living in the remote areas of the country. Consequently for all the weekends of January 2015 covering every Saturday and Sunday except for the first Saturday, NKF carried out health checks from morning till afternoon in eight kampungs in Kuala Kubu Bharu, Selangor with the deployment of its LifeCheck Mobile Health Screening Teams. NKF was blessed to be the recipient of a Toyota Hiace van donated by UMW Toyota Motor Sdn Bhd from part of the proceeds from the sales of tickets for the performance by the Covent Garden Soloists’ Orchestra. The performance was in conjunction with the 25th anniversary of the Toyota Classics 2014. NKF sincerely thanks UMW Toyota Motor Sdn Bhd for the wonderful gift of the van. 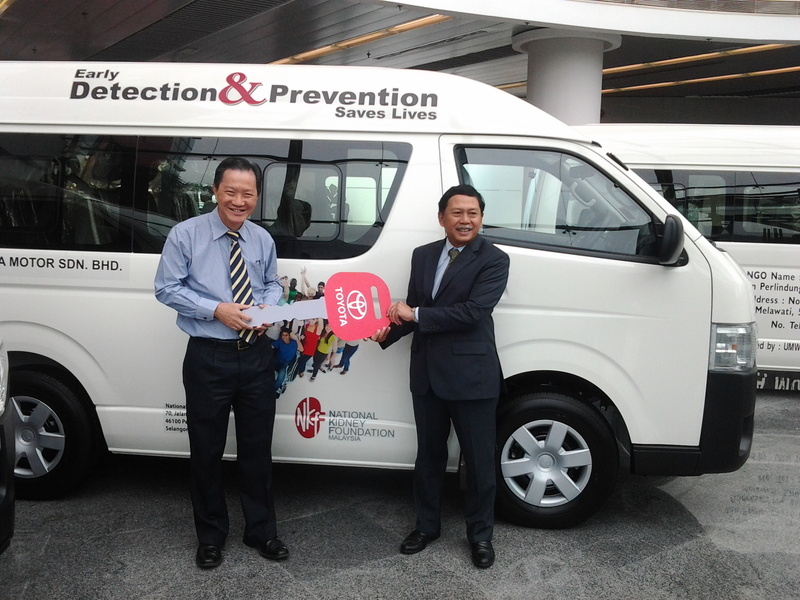 The vehicle will be deployed to the soon to be launched NKF LifeCheck Health Screening unit in Kota Bahru, Kelantan. 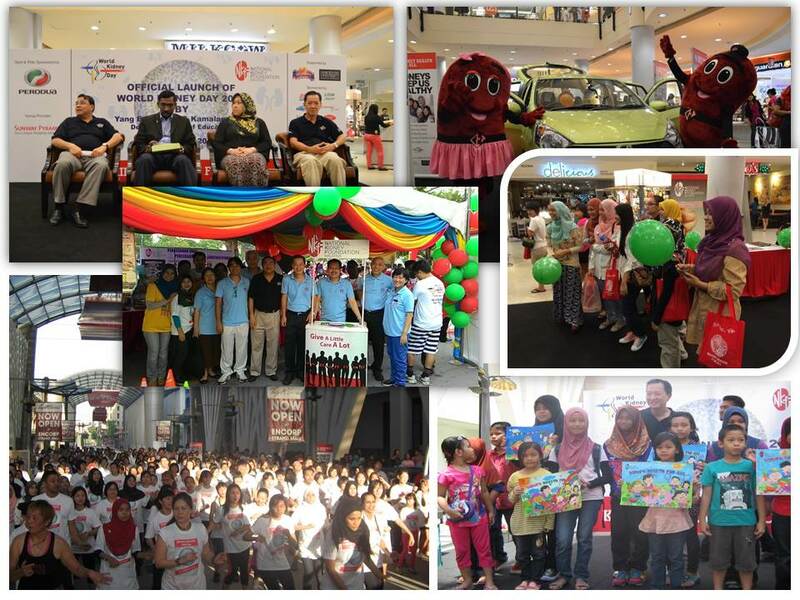 The World Kidney Day 2015 celebrations by the National Kidney Foundation of Malaysia (NKF) reached the crescendo when hundreds of participants from all creed, gender, ages and walks of life danced in support of better kidney health at the Encorp Strand Mall in Kota Damansara. In the wake of popularity of the 2014 dance marathon, the 2015 dance marathon saw more than 600 people gathering as early as 7 o’clock in the morning of 29 March 2015 to put on their dancing shoes to dance to popular dance styles such as the Zumba and Sh’bam for more than three hours. They were led by Celebrity Fitness Malaysia’s superstar instructors – Sunny Cheong, Deno Au, David Thoong and Vodal Gomez. On 5 April 2015 the NKF Patient Support Group (PSG) with the support of the NKF Welfare Department organised a one day trip to Sekinchan, Kuala Selangor. A total of 37 people comprising 21 patients, 12 family members, one Staff Nurse and 3 Dialysis Assistants participated in the programme. 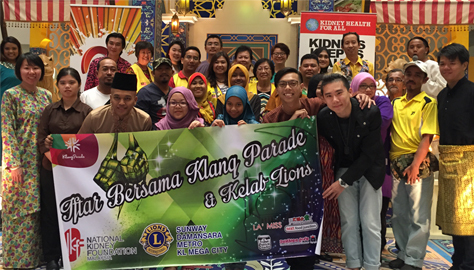 On 9 July 2015, the management of Klang Parade, a shopping complex in Klang town, organised a Ramadan event to brighten the lives and economic well-being of amongst others poor kidney patients dialysing at Pusat Dialisis NKF-Kelab Apex and Pusat Dialisis NKF Bakti in Klang. 5 patients and their families ushering the festival attended the function where each of them received “duit raya” packets from the shopping mall, Ideal Event Management Sdn. Bhd., and 2 celebrities, Cik Dina Nadzir and Encik Baki Zainal. The launch with the co-operation of NTRC, saw the presence of Datin Dr. Fadhilah Zowyah Lela Yasin Mansor, the Chief National Transplant Procurement Manager of the National Transplant Resource Centre (NTRC). 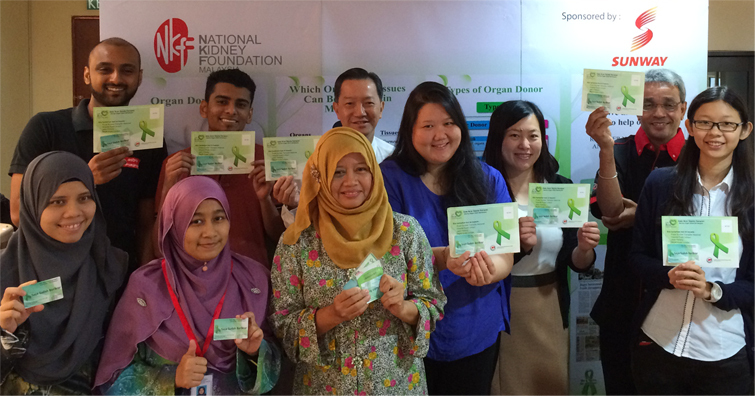 Hence on 8 July 2015 at its premises, NKF CEO Mr. Chua Hong Wee initiated the launch of the National Organ Donation with the theme “Gift of Life” via a short video hosted on the Foundation’s social media that include its website, Twitter and Facebook. On 3 September 2015, NKF together with the Ministry of Health (MoH) and the Malaysian Society of Nephrology (MSN) organized the “National Seminar – Funding of Haemodialysis Treatment” at the Le Meridien Hotel Kuala Lumpur. Response to the invitations was very encouraging with 113 participants attending the seminar, which was graced by Tan Sri Dr Ali Hamsa the Chief Secretary to the Government. Pusat Dialisis NKF – Kelab Lions Alor Star (Alor Setar) celebrated its Family Day on 4 September 2015 by organizing a one day trip to Penang Island. The celebration was a departure from the normal holding of a dinner and was intended to bring about greater excitement and foster closer interaction among patients, their family members and staff of the centre. In conjunction with its family day on 4 October 2015, Pusat Dialisis Amal Fo Yi (Unit 1), Penang organized a 5 course Chinese lunch from the NKF family day budget for its patients, their family members and staff.The function was held at the Ming Garden in Penang Time Square and was attended by 80 people with patients and their family members at the lunch being given water tumblers as door gifts with the compliments from SANDOZ, a Novartis company. On 20 October 2015, Y. Bhg. 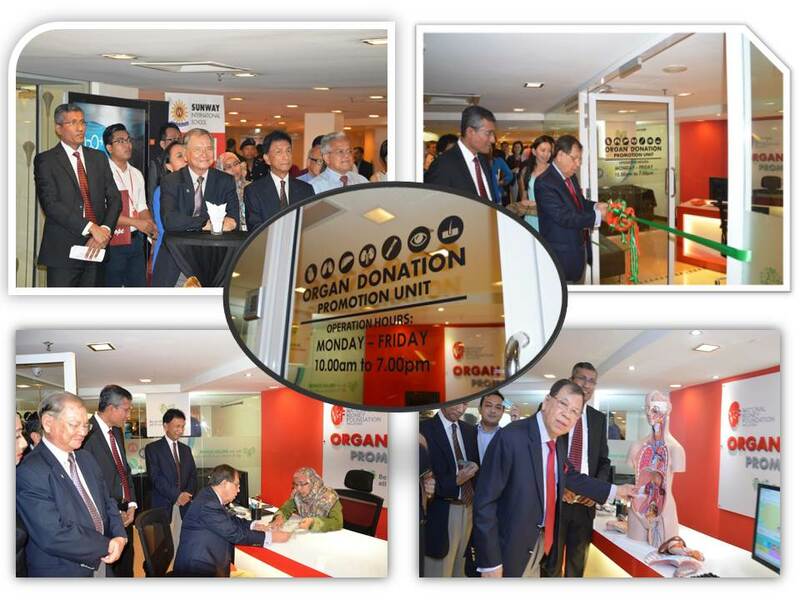 Tan Sri Datuk Seri Razman M. Hashim, the Deputy Chairman of the Sunway Group, officially launched NKF’s first organ donation promotion unit at the Sunway Pyramid Shopping Mall. The unit is part of the Foundation’s continuous efforts to raise awareness of kidney disease and at the same time to encourage organ donation. The unit has been set up with the assistance of the Sunway Group and is located at Level CP3 of the shopping mall.